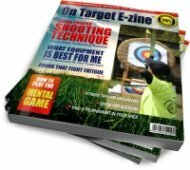 On Target E-zine™ is the dedicated FREE source for learning target archery with a focus on educating you in simple, easy to understand language. We show you the necessary steps to becoming a highly successful recreational or competitive archer with real up-to-date information you can sink your teeth into. Cut through the mountains of confusing, controversial and unorganized misinformation on the internet and at your local club about archery! On Target E-zine™ delivers the real meat and potatoes without the hype and gets straight to the point. Our special reports deliver up-to-date information about everything from Basic Steps to Success to cutting edge information on how to improve your shooting form with best practices for techniques that get instant results. Want to learn the secrets of best-in-class archery pros and how they stay ahead of the competition? Like any other sport, Archery is a very physical game that requires proper fitness and nutrition to keep you operating at peak performance through a full day of competition. However, all too often an archer will approach the tournament with the wrong attitude and fail to look at the more important aspect that separates the good performer from the great athlete. Want to know how to become a best in class archer? Beat your opponents by mastering the mental game and remain focused in the toughest times. Learn how to recover from a misplaced shot quickly without losing your cool. On Target E-zine™ teaches you how to be the toughest mental competitor on the field and how to put on your game-face and remain focused...shot after shot. Are you an individual training on your own or an instructor of a small archery club wondering how to advance your team to the next level and compete with the big-boys? 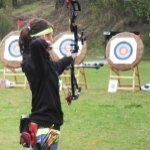 Regardless if you are a self-coached amateur or the head coach of your archery team or even a Master or Pro, you can achieve new performance levels by learning goal setting techniques, physical conditioning and mental preparation skills that get you focused and on-track for the next tournament. On Target E-zine™ delivers the inside scoop. The time spent training and practicing will become more meaningful and rewarding allowing you to achieve greater performance levels, shoot tighter groups and achieve higher scores. Want to know how to avoid information overload? While most on-line archery websites are trying hard to appear as though they are educating their visitors, they really have one goal in mind and that is - to sell their products or services. On Target E-zine™ brings you vital news and conventional wisdom that is short and to the point and free from predisposed information that is geared toward selling a specific product. Start saving time and learn how to take your archery skills to the next level NOW. Get your FREE subscription TODAY so you don't miss a thing.